Provide comfort for the family of Gary Jones with a meaningful gesture of sympathy. Gary W. Jones, 77, of Independence, MO passed away April 9, 2019. Visitation will be Saturday, April 13, 2019 from 9:30-10:30 am at Speaks Suburban Chapel. Funeral services will follow at 10:30 am. Gary will be laid to rest next to his parents in Floral Hills Cemetery. Gary was born on January 7, 1942 in Kansas City, Missouri to Clyde and Nora (Hinton) Jones. He was a graduate of NorthEast High School. He retired after 28 years of service from University of Missouri Kansas City. 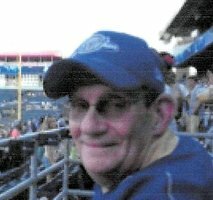 Gary loved being around people and enjoyed sitting in the stands cheering on the KC Royals. He was a long time member of the Independence Ave. Baptist Church and especially enjoyed Sunday School. Above all else Gary loved his family and friends. Gary overcame many obstacles in his life, never one to complain, he always put others before himself. He was dearly loved and will be forever missed by family and friends. Survivors include: brother Donald Jones and his wife Dixie; sister Cheryl Deis and her husband John; several nieces and nephews; a large extended family and many friends. Gary is preceded in death by his loving parents Clyde and Nora Jones, sister and brother in law Martha and Darrell Yokley, and an infant sister Betty Lou Jones. Memorial contributions may be made to Ascend Hospice in Gary’s memory. To send flowers in memory of Gary Wayne Jones, please visit our Heartfelt Sympathies Store. Consider providing a gift of comfort for the family of Gary Jones by sending flowers. Provide comfort for the family of Gary Wayne Jones by sending flowers. My heart went out to your family for the loss of Gary I loss my mother over 10+ years ago. But I found comfort in these few scriptures. I hope they find comfort for you during this difficult time. Psalms 37:9,-11,29 9 For evil men will be done away with,j But those hoping in Jehovah will possess the earth.k 10 Just a little while longer, and the wicked will be no more;l You will look at where they were, And they will not be there.m 11 But the meek will possess the earth,n And they will find exquisite delight in the abundance 29 The righteous will possess the earth,i And they will live forever on it.j Please look up these scriptures in your own copy of the Bible. It will give you confidence you will see Gayr again under righteous condition where he is no longer sick but restored youth and healthy.